At a shoot lunch towards the end of the season, my husband was served what he termed “the best pudding I’ve ever eaten”. He loved it so much he asked his hostess, Clare Pelly, for the recipe so that he could make it at home. Only joking; I mean so that I could make it for us all. I don’t mind at all: I’m happy to be the cook in our relationship because I enjoy it and because I’m better at it than he is, just as there are many things I don’t like doing which he is happy to do and is better at than me. I imagine this is how most successful partnerships work. As it turns out, I’m very grateful to him for getting me the recipe for this “best ever” pudding because it’s absolutely delicious. 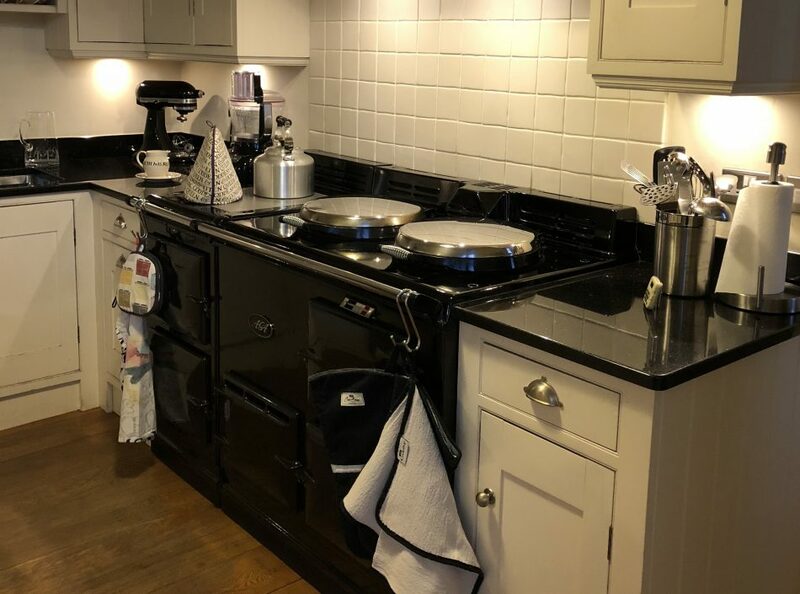 Clare is also an Aga cook and the pie is particularly suited to Aga cooking because it can be baked on the floor of the roasting oven, which gives wonderful, crisp pastry. I always worry about the Aga cooling down if you give it too much to do at once but yesterday I cooked a pheasant, some roast potatoes and this pie in the roasting oven in the space of one and a half hours and everything was perfectly cooked. The first time I made this pie we were a little disappointed that the cinnamon flavour wasn’t very strong. Cinnamon is one of my husband’s favourite things so he did a bit of research. First of all he saw that the cinnamon I’d used (by Bart’s) was a blend “sourced from several Fairtrade producers” and that the cinnamon considered to be the best is from Ceylon. So from the website cinnamonhill.com I bought some Ceylon cinnamon sticks and the next time I made the pie, we used the fine Microplane grater to grate some for the topping and reader, I can confirm it tasted noticeably better. This traditional Norwegian celebration cake (translation: soft cake) is part of my childhood in a way that no other food is. My grandmother, aunts, and mother all baked it regularly when I was growing up and then my mother passed the recipe on to me. Nowadays when we go on holiday to Norway, it’s my cousins who make the bløtkake and no doubt they have passed the recipe down to their children as I will to mine. My mother is a great cook and loved introducing her British friends to Norwegian specialities, but when she was first married to my (English) father she also learnt to do an excellent Sunday roast and many other British recipes. She would make a bløtkake for our birthdays and if friends were coming round. For a few years she ran a small catering firm specialising in parties and weddings, and this cake was probably what her customers requested the most. I can remember helping her with deliveries sometimes which involved me sitting in the passenger seat of her car with the cake in a container on my lap, hoping we didn’t have to brake suddenly. The cake is not complicated or difficult to make. It uses a fatless sponge so you needn’t feel guilty about the amount of cream required to make this cake delicious and special. I made it recently for my youngest son’s 18th birthday. You will need an 8″ or 9″ springform cake tin, greased and base-lined. When the cake is cold slice through the middle horizontally so you have two pieces. Even better, slice it into three layers. In fact, I wish I’d done this for my son’s cake and will definitely do it next time. It makes a more impressive, moist and luscious cake. You may need more cream but given it’s a cake based on having lashings of cream, who’s going to quibble about that? One more thing: if you don’t eat the whole cake at first sitting, and it is definitely best when fresh, make sure you store it in the fridge. My mother has read this post and passed on a tip which finishes the cake off nicely: keep back a little cream for piping round the bottom. As you can see from the photos, mine has a bit of a gap and would have been improved hugely if I had done this. What can I say, except I clearly haven’t inherited my mother’s knack for presentation.